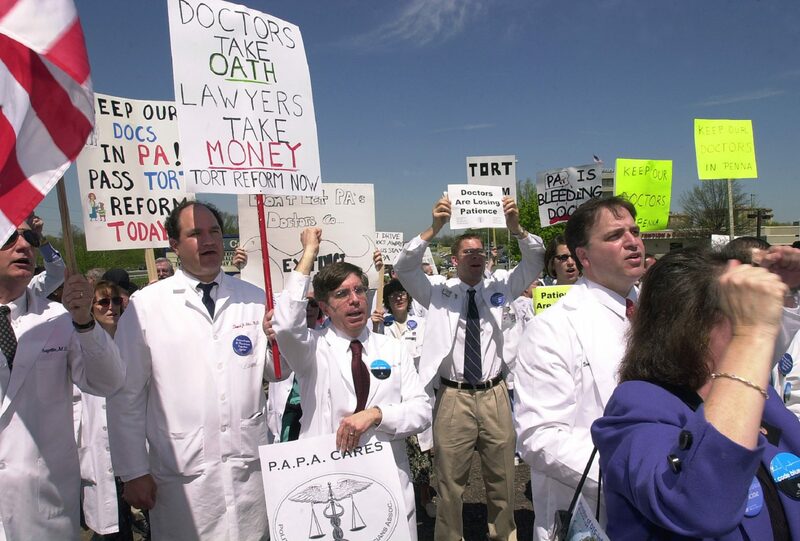 FILE PHOTO: Doctors rallied in 2003 in protest against rising medical malpractice premiums in Pennsylvania outside the Valley Forge Convention Center in King of Prussia. Is the deck stacked against patients? Fight over medical malpractice lawsuits returns to Pa.
David Wenner has worked for The Patriot-News/PennLive since 1999 and has won numerous awards for his reporting. He often writes about health care as well as breaking news. He appreciates knowing about any important, troubling or otherwise newsworthy situation in central Pennsylvania. He can be reached at dwenner@pennlive.com or 717-255-8172. (Harrisburg) — A plague of medical malpractice lawsuits had Pennsylvania’s health care system needing life support in the early 2000s, at least in the view of hospitals and doctors. The hospitals were threatening to close maternity wards. Doctors were threatening to leave the Commonwealth altogether. In response, state lawmakers passed a package of reforms aimed at both weeding out frivolous lawsuits and making medical care safer. One reform eliminated “venue shopping” — where malpractice lawyers could use a medical provider’s business ties to file cases in Philadelphia, rather than the county where the alleged malpractice happened. At the time, many, many malpractice cases were being filed in Philadelphia, where juries had a reputation for siding with victims and giving large awards. That changed dramatically after the new rule requiring such claims to be filed in the county where the malpractice allegedly happened. During the three years leading up to the change, an average of 2,733 medical malpractice cases per year were filed in Pennsylvania,including 1,204 per year in Philadelphia. In 2003, after the change, the statewide total fell to 1,712, and the number filed in Philadelphia fell to 577. Moreover, the number of medical malpractice lawsuits continued to drop throughout the state. In 2017, 1,449 medical malpractice lawsuits were filed in Pennsylvania, a decrease of 47 percent from before the reforms. Now, a committee of the Pennsylvania Supreme Court is considering eliminating the rule against venue shopping. The committee said the rule “no longer appears warranted,” and also cites the possibility that “far fewer victims of medical negligence” are being compensated. A spokeswoman said the committee, which is accepting public comment on the matter until Feb. 22, wouldn’t answer questions about topics that include what prompted it to consider the change. The situation has resurrected the debate from the early 2000s, when medical providers argued there were too many frivolous lawsuits, and lawyers who represent injured patients argued there were too many medical errors. 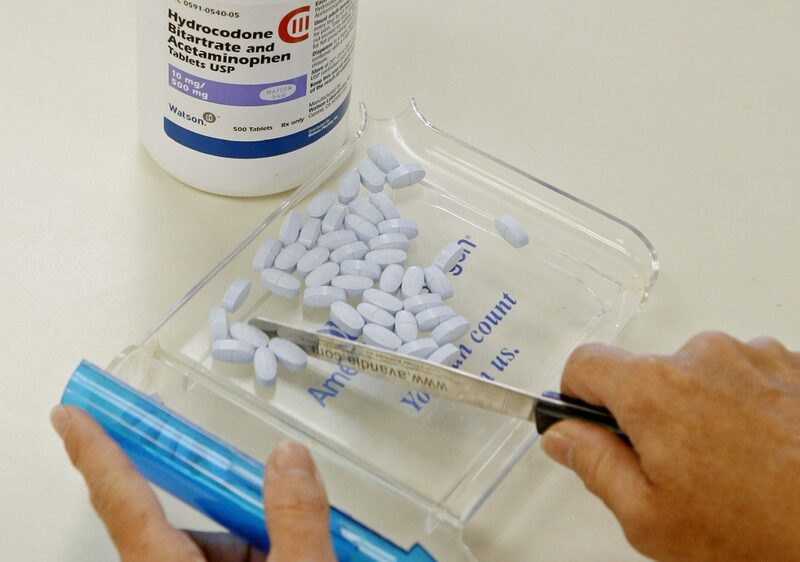 FILE PHOTO: A pharmacy tech poses for a picture with hydrocodone bitartrate and acetaminophen tablets, the generic version of Vicodin in Edmond, Okla. Organizations representing hospitals, doctors and nursing homes are also against the change. Cliff Rieders, a personal injury lawyer based in Williamsport, argues it’s nearly impossible to win a medical malpractice lawsuit in many Pennsylvania counties. A major problem, he said, is that in smaller, more rural counties, the local hospital or health system is often the main employer, with an outsized proportion of the jury pool working for the local system or having a personal connection. “People in those counties feel their jobs depend on the economic viability of those hospitals,” Rieders said. According to Rieders, the high odds against winning a case discourage victims and lawyers from going to court. “The experiences are so negative that people refrain from bringing those cases, even when they are legitimate,” he said. Rieders and trial lawyers further stress that Pennsylvania’s venue rule for medical malpractice claims means they are handled differently than other civil lawsuits. “There shouldn’t be special rules for health care providers. Health care providers are like other professionals. They are able to insure against their risk and they should be subject to the same rules as everybody else,” said Shanin Specter, a personal injury lawyer who is also an adjunct law professor at the University of Pennsylvania Law School. Schroder said he agrees everyone should play by the same rules. But rather rather than eliminate the ban on venue shopping, it should apply to all civil lawsuits, he said. He calls arguments that some counties are dominated by health care employees “some of the most bogus arguments I’ve ever heard.” He argues that in areas like Philadelphia, with their high concentrations of hospitals and medical schools, it’s even harder to find jurors lacking health care ties. According to Schroder, common sense and convenience dictate that a medical malpractice lawsuit should be filed in the county where it took place. “No one is denied access to their local county court in this … Venue has nothing to do with denying patients their access to justice,” he said. He contends malpractice lawyers, who typically keep a third of whatever the jury awards to the injured person, want to get more cases into Philadelphia so they can receive bigger payments. In the years since the early 2000s, there has been tremendous consolidation in health care. For example, Philadelphia-based Penn Medicine now includes Lancaster General in Lancaster County. As a result, a change to the venue rule would cause Philadelphia to be flooded with more cases than before the reform, according to Schroder. This much is certain: progressively fewer medical malpractice cases have been filed in Pennsylvania, and the odds of winning one are steep. The number of medical malpractice lawsuits that resulted in a jury verdict dropped from 326 per year in the three-and-a-half years leading up to the 2002 reforms to 102 in 2017. The number of verdicts in favors of doctors or hospitals rose to 80 percent, up from 73 percent before the reforms. The number of jury awards of $5 million or more fell from about nine per year to two in 2017. The rule against venue shopping wasn’t the only part of the 2002 reform package that affect the number of cases that get filed. One requires lawyers planning malpractice lawsuits to obtain a “certificate of merit” from an independent expert. Another part of the package was aimed at patient safety and reducing medical errors. Trial lawyers such as Rieders argue that the decline in cases and scarcity of verdicts favoring patients shows the balance has shifted too heavily in favor of medical providers. Schroeder contends the decline in malpractice suits is proof that many meritless suits were being filed in Philadelphia, and also that safety-related reforms have resulted in fewer medical errors. The issue of medical errors has always been a murky one. Experts have long said the system of resolving medical errors through lawsuits encourages health care providers to hide them, rather than learn from them. In 2016, patient safety experts at Johns Hopkins University concluded more than 250,000 deaths per year in the United States are caused by medical error, making it the third-leading cause of death. Moreover, studies have concluded that many legitimate victims of medical negligence never file a claim. “The current jury system of malpractice litigation results in few compensated patients. This may in part be because only a small percent seek to pursue litigation or even know if there has been a possible malpractice committed,” wrote Dr. Joel E. Chodos, a Delaware-based physician who also has a law degree and who wrote a 2015 paper looking at alternative ways to handle medical malpractice cases. Doctors, meanwhile, have their lives upended, and their reputations tend to suffer even if they win the case. Chodos, in his paper, discusses specialized courts which have been used to settle medical negligence cases. Switching to such courts would likely provide smaller compensation to victims, but compensate many more of them. In an interview, he said he believes it would be a bad idea to go back to the old venue rule in Pennsylvania. “Then you have people trying to manipulate the system by trying to find the court this is going to be most sympathetic to their client, rather than trying to prove their case and get justice,” he said. One of the 2002 Pennsylvania reforms created the “Patient Safety Authority,” which receives reports on medical mishaps including “serious events.” Serious events are unexpected occurrences during medical treatment that hurt or kill patients. They include things like operating on the wrong site — the authority receives about 59 such reports per year — to medication errors to infections picked up in hospitals or nursing homes. The purpose of reporting them to the authority is to study and learn from them. In 2017, the authority received 7,881 reports of serious events. Rieders, who served many years on the authority’s board, contends a majority of them amount to medical errors that warrant compensation. With the number of serious events being higher than the number of malpractice lawsuits, he contends it’s proof the deck is stacked against patients.